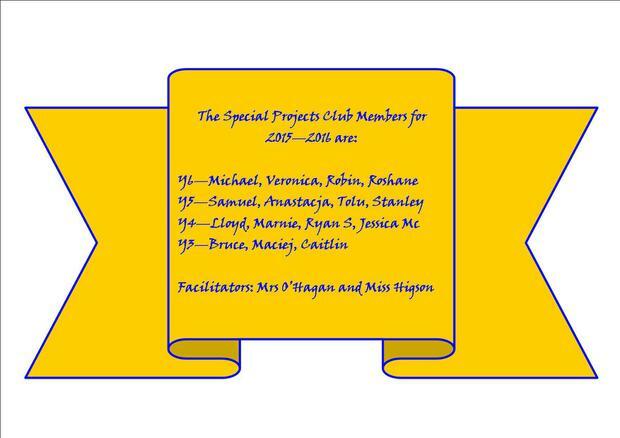 Our School Council is known as the Special Projects Club because as well as representing the views of pupils across the school we also actively lead the school through campaigns and initiatives. leading the school's drive towards our goal of 100% punctuality - EVERY child to be "In the line at five to 9". We designed a banner and had it made - you can see it in the playground every morning. We also had a large clock installed on the playground to help us all be where we should be at the right time. You can also still see our super posters all around school. Our main aims this year are to improve the playground and give more pupils the chance to participate in different sports in P.E. ALL IDEAS WELCOME! Remember - your class reps are there to represent YOU. Make sure you tell them your ideas and ask them to share them with the club. A major new campaign is coming soon ...!!!! !